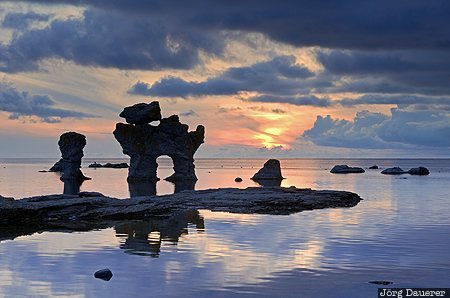 The bizarre raukar (sea stacks) at Gamla Hamn and their reflexions in the calm Baltic Sea in front of a colorful sunset. Gamla Hamn is on the island Fårö north of Gotland in the south of Sweden. This photo was taken in the evening of a sunny day in August of 2014. This photo is in the Photo Calendar "Südschweden". This photo was taken with a digital camera.